A witty, fast-paced, action-packed crime thriller. You never expect to stand trial for the murder of your wife, let alone if you didn’t do it. When you find out that your wife may not be dead but rather kidnapped by human traffickers for sexual slavery, you could be forgiven for being a little annoyed. Proposing lead therapy for the traffickers in an effort to help them reform and free your wife isn’t appreciated, by the traffickers, the police, or potential future employers. Can one man, dubbed “Dee” by his new family, take down organised crime, avoid the police and traffickers, and keep his gun loaded? Overturned Stones is my current work in progress. The first draft is being reviewed, with some very good feedback coming it. I’ll be submitting it to publishers after the next draft. 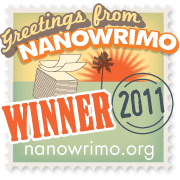 I won NaNoWriMo for 2011 with this novel, the 50,000 words providing a nice foundation for a fast paced story. George Taft and his dog Fox like to be alone. They live on the edge of a national park in the Canadian wilderness, spending their days hunting and observing wildlife. Then someone made the mistake of crashing a spy drone in Taft’s backyard and killing Taft’s friend the park ranger. Suddenly a wanted man, Taft decides to show people exactly who they are messing with. Where my Overturned Stones stories and shorts, like Hard Wood, are fast paced witty crime thrillers, Snow Blind is a more gritty fast paced witty crime thriller. It is good to diversify a bit. When you retire from vigilantism you usually die or go to prison. Dee managed to take option C, which has just been rudely interrupted by a group of mercenaries who want his help knocking off pharmaceutical counterfeiters. Want, at gun point. With his family in danger, his life on the line, a new mission to fulfil and a pretty good idea he is meant to be a patsy, Dee is missing his morning sleep ins. I never intended to write a sequel to Overturned Stones, but I found that I had a lot of ideas that worked with my protagonist, Dee. This time I wanted to deal with another serious issue, counterfeiting, and have plenty of violence directed toward people who would deprive people of real medications.